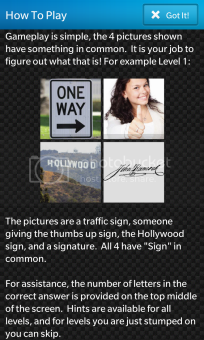 Simple, addictive game: The 4 pictures shown have something in common. It is your job to figure out what that is! This was game was a joint effort by myself and another developer (SCrApps). We are both independent developers involved in developing communities such as OSBBx and participate in BlackBerry's official sample projects. 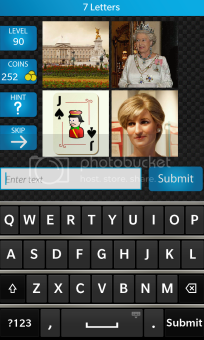 Unlike other types of 4pic 1word games, we decided to use the native keyboard to give support to the upcoming Q10 device as well as letting players make use of the beautiful typing experience on BB10. The Z10 and Q10 versions are written in native Cascades code (no Android porting). So it should run much better than the competition. And the PlayBook version is written in WebWorks. Also the game requires no silly permissions, internet access, annoying advertisements, etc. Hope you enjoy! Last edited by Brian Scheirer; 03-18-14 at 11:03 PM. swilliams1019, sf49ers, KidCaboose and 2 others like this. 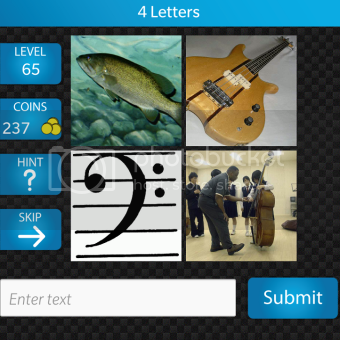 Out of curiosity, and to help me figure out which to go with, can you tell us what the main differences are with your game and a sideloaded 4 Pics 1 Word, and the recent Pics and Words? Price is one. Internet connection is another. Adds is another. I can see from the screenshots the layout is a little different, and there is no limit in th letters you can use. Also will the game receive updates to expand the word list? Will there be any chance of Scoreloop integration or interaction? 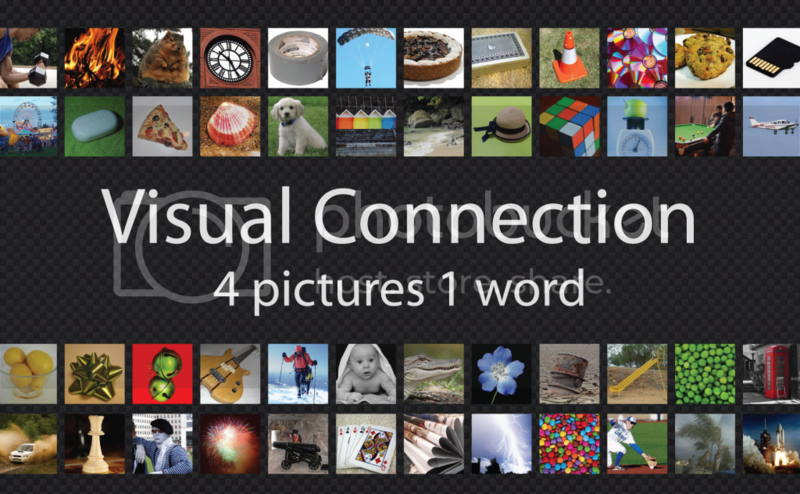 The game is named Visual Connection, yes it is the same style as 4 pics 1 word. And it's not a knockoff if the "original" game doesn't exist for BlackBerry. My app will support the Q10 much better than any other version because of my use of the native keyboard. I explained this in the first post, I hope you still give my game a shot... I'm open to feedback. Thanks. This is age old concept on which there are card games also. also so many flash or web implementations exist. So it is unfair to tell it a knock-off on this basis. Only in case the photos in the app are from other similar apps then it can termed knock off. I have not played this game yet to know this. Visual Connection: cost $0.99, don't have to side load, no internet connection required, uses native keyboard to support Q10 as well as the Z10, even though you can use any amount of letters I do say the word has X number of letters at the top of each puzzle, in app purchases for more coins, 225 levels currently. 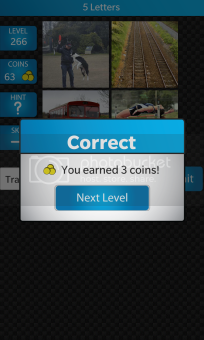 I do plan on adding more levels, Scoreloop, and got a few other secrets in mind. All updates will be FREE. Released the game how it sits now to get feedback and gauge interest on BlackBerry 10. Honestly it was a pretty big undertaking to organize all the images, hints, levels, etc. I believe I have created a very bug free, smooth running app. I hope you'll support indie devs like myself and SCrApps who put this out for you guys. Also if you see in my blog in my signature I provide a lot of help to other developers with Cascades samples and tutorials. bbquincar, DJRikko, joesworld and 1 others like this. Uhh, you had me at Scoreloop. When this appears in the game's description, it'll be on my Z10. My Games App friends need to see my achievements! I don't know how you could challenge friends at the game, but if you could figure that out too... all I can say is woot. Fruit Blitz still seems to be holding a dominating 1st position over the favourite lists. I think a lot of the appeal is generated from the constant challenges being issued, both to friends and openly (allowing to meet more people and make more friends). We need more games with this feature. bbquincar and DJRikko like this. Hey Brian, I really appreciate the fact that you decided to develop a native version of this game. So yay to that Also, I read your reasoning regarding using the native keyboard, and while I agree it is great to let people experience the great keyboard, I find that part of the appeal (well for me at least) to such games is seeing the scrambled rows of letters ( usually 2 rows). Reason being, it can make the game a tad more frustrating for some if all you're left is with the keyboard and a clue to the number of letters in the word only. Having played 4 pics 1 word, I actually appreciated the fact that the 2 rows of scrambled letters were there. Especially during the times when I feel stumped, I'd try forming different combinations of words in my head in a bid to figure out the answer. While it may sound silly, I actually prefer it like this than just the native keyboard. I believe Draw Something employed a similar 2 rows of scrambled words for the person to figure out the answer, so such a concept should be quite accessible to people. I, for one, would enjoy it if it were like that and not the native keyboard. I'd also like to mention that Brian and I are very open to any suggestions that anyone has on this game It was a lot of fun to make, and that translates into being a lot of fun for us to improve and update. So if you have any questions or suggestions, hit either of us up either by PM here on CrackBerry, or via email, or via BBM. In addition to scoreloop, we do plan to have some other awesome features (for example, guest mode) and to continue adding new levels. bbquincar and KidCaboose like this. This might not be the final version of this feature, but the logic has been completed and, in one form or another, it should be in an update before too long. KidCaboose and Javid Gozalov like this. Snap! That's awesome! Why did you photoshop the game images into a PlayBook, though? That's a PC screenshot of the PlayBook version (which, as Brian mentioned, is coded in WebWorks until Cascades is PlayBook compatible - that is, until the PlayBook gets BB10) running in the Ripple emulator What all that means is that I didn't photoshop anything except the blurs to hide the images from people who haven't reached level 171 yet lol. Ahhh. Aha! Gotcha. Is it update time yet? Hopefully soon It takes a little bit of time to implement a new feature into two different versions, but it should be soon. I'll try to remember to post here when the update is live. Wow yeah this is kinda what I had in mind Man, the update to this game will be sweet if it has that. This feature is confirmed to be in the next update right, or two updates from now? I don't have a credit card yet so I can't purchase things on World. But you said you're an indie dev, and I'm just starting out too so I'll just leave a comment for your app. Two indie devs actually. And Indie doesn't mean new, it just means that we're not affiliated with a large company. I personally love the VC UI and prefer it to any of the competition, but everyone has different tastes. If you can get us a little more detail than "the other game like this is somewhat, let's say, more visually appealing" then maybe we'll be able to change it. Also, BlackBerry World purchases can be made via PayPal, you don't need a credit card. Maybe a more appealing app icon then? Unless that's the look you're going for. As a consumer, the way the icon looks it's what often draws my attention from all the flotsam in BlackBerry World. When I see a pretty app icon, all button-like, rounded corners and a border... I assume there's something even prettier inside. Question for the devs: Does purchasing it once get it on both PlayBook and Z10? Yes One purchase gets you the Z10, Q10, and PlayBook versions. Picked up this game today - happy to support native. Great little game. Huge Free Update to Word Shuffle! Game saves, new levels, sounds, and MUCH more!